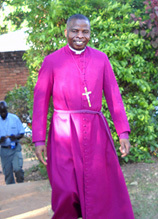 At his enthronement at St. Peters Cathedral, Likoma Island, on Nov. 7, the Rt. Rev. 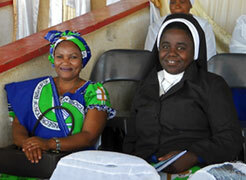 Fanuel Magangani shared his vision for the future of his diocese with the people. Here is the text of his charge to them. “Yes We Can” – words used by President Barack Obama in his inaugural address, words that inspired people all over the United States of America; words that inspired people all over the world; words that inspired people here in Malawi. Obama had a vision. He has the determination that drives him to do his best to make that vision become reality. We have a vision for the Church of God here in the Northern Region. We call upon every individual member of our Church from Likoma in the east, to Embangweni in the west, from Mfula in the south, to Chitipa in the north: from the smallest child in the Sunday School to the most senior elder of the Church, from the newly selected ordinand to the most senior member of the clergy, from the most recently licensed to the longest serving catechist, from the watchman who stays up all night to those who use their skills in administration I say to you “Yes we can!” We invite you to work with us to do our best to make this vision become a reality. Our vision is that everyone from the youngest to the oldest in the Diocese of Northern Malawi will grow closer to the Kingdom of God. We invite you to work with us to build on all that we have achieved with the first two Shepherds who led our flock, Bishop Biggers and Bishop Boyle, good strong shepherds who have led us into greener pastures and gave us a clearer vision. We invite you to work with us to build on all that we have achieved so far working with and supported by the love and prayers and generosity of our friends in the vineyard of the Lord from all over the world, from the UK and the US, from Canada and Germany and New Zealand. If we work together by the Grace of God and with the help of God we will achieve great things in our Diocese. There is only one who can make us strong to do all this; Our Lord and Saviour Jesus Christ! If our faith is to be strong, if our vision is to be clear, if we are to work only for what is good and just and true then we must stay very close to the Good Shepherd himself. We must stay close to Jesus. We must grow in faithfulness in saying our daily prayers. We must stay close to Jesus so that we can learn how to grow to be like Him. We must walk with Him through the Gospel so that we learn to see with the eyes of Jesus, we understand others with the mind of Jesus and we reach out to others with the love of Jesus. If we are among the fortunate ones who have benefitted from education, if we have and read our own Bible, then the burden of responsibility should fall happily upon your shoulders to share your skills with others less fortunate. If you are a member of the clergy it is your privilege and calling to nurture and nourish your flock in their lives of prayer and in the knowledge of Jesus through the Gospels. It is only in this way that the river of faith will run deep in our diocese, that it will not dry up in the scorching sun should difficulties and trials come upon us. Remember the Apostles were few in number when our Lord Jesus commissioned them to spread His Good News to the ends of the world but their faith was so strong and deep that they were prepared to give up their lives rather than be turned back from their work for the Kingdom. We know that during the time of identifying a bishop to shepherd the flock in the Diocese of Northern Malawi we did not all think in the same way, we did not all speak in the same way. Things were done and said about us that were not constructive. To err is human and to forgive is Divine. We are all as human beings subject to error and we say we have forgiven those who offended us and we say the same thing to those who in any felt offended. But now is the time for healing and reconciliation. To you who are afraid we say, “We are like Joseph whose brothers had been jealous of him and like Joseph we are your brother whom you ill treated and like him we thank God for his guidance. Like Joseph we only want to be your brother seeking what is best for us all as the Church of God.” Indeed, don’t be afraid of us, even now that we have the Bishop’s mandate; so for true healing don’t look to me but to God Himself. We want to offer a special vote of thanks to the Vicar General, Canon Chifisi and the staff in the Diocesan Office. You have done so much to keep the diocese running smoothly in the absence of a bishop. You have had difficult decisions to make and you have been sacrificial in your service. We pray that will continue to work well together, supporting one another, to spread the Gospel in the Northern Region. Let me say a word especially to the clergy and catechists. We have big challenges my brothers in the Lord. We need to understand who we are before God. We need to answer this question “Who am I?” I believe a true answer would be that each one of us is a ray from the light of God. Let us therefore reflect this light to the flock God has put into our care. We also need to remember that we have the responsibility my brothers in the Lord, the responsibility of showing the world how precious a thing it is for us to be called to serve him. We sometimes do not realize what an amazing privilege it is to stand at the altar of the Lord to present the prayers of the people to God. To whom much is given from whom much is expected. To our beloved Sisters of St. Mary, we say thank you for every support you have rendered to us and we know that we shall work hard to support your ministry. We would like to assure you that we shall find ways of developing your ministry in any best way we can. To our beloved faithful laity, you are the Church and for this Church to develop you need to grow in faith. We believe that God has sent me to be your shepherd. We pray that as your new shepherd we will lead you to a good pasture. Our Diocese ili pa chiwopyezo chachikulu ku nkhani ya chuma (is in a dare financial challenge). We have so much to thank our Brothers and Sisters in Christ who are labouring with us in the other parts of the Lord’s Vineyard. Without their loving and prayerful support we would be so much less than we are today. Because of their sacrificial giving it has been possible not just to maintain the day to day running of the Diocese but also to meeting some of the very desperate pastoral needs of health care and education, of providing clean water and food in times of famine, of providing funds to teach better ways of farming, in building new churches and providing good houses and transport for the clergy to visit their flock. The list is very long. But more than this we have been greatly enriched by the visitors we have received, by the people who took the trouble to come and see what it is like where we stay. We know that their lives too have been changed by what they experienced here. We know too that with the current global financial situation it is getting harder to raise funds. Like Joseph we think that maybe the years of plenty may be drawing to a close and that we must prepare for the years of famine. There is a well known saying. “Give a man a fish and you feed him for a day. Give a man a net and you feed him for life.” When our Diocese was in its infancy we were very dependent on our partners overseas to feed us. Now it is time for us to make that net that will feed us for life. We must own this Diocese and its missions and ministry by giving generously and it is going to take some creative and imaginative thinking. Looking at the situation from the grassroots up in new ways to see how we may sustain the life of the Church. It may mean sacrifices and difficult decisions. We pray that our partners will continue to walk with us as we seek God’s will in all of this until such as time when we shall be ready to walk on our own. We hope to create a strategic plan of providing solid and viable investment as a strong foundation for the future. 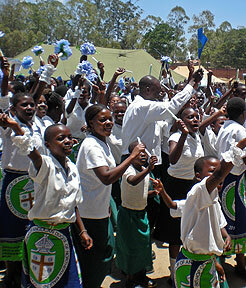 We are the Diocese of Northern Malawi not the diocese of some parts of Northern Malawi. In the early days the missionaries from the various Churches focused on different areas of the region in order to be able to focus on teaching and preaching the Gospel more effectively. Now the agreement that existed between the Churches then works no longer. Mission is an essential part of the Christian calling. As our Churches grow stronger and deeper in their faith the work of mission and evangelization should grow stronger, spreading into areas where as yet there is no Church carrying the Good News of the Gospel to spread over the whole region. We cannot end this Charge without reference to one particular area and that is HIV/AIDS. We have lost many dear friends and family members through this terrible disease. At the beginning of this twenty first century it was considered such a terrible and shameful thing that few dared go for testing, few dared speak of it. Likoma and Chizumulu Islands are a shining example in the fight against HIV/AIDS and other areas within our Diocese are following. The Anglican Church has played a major part. You are the testimony that our predecessor, his Lordship Christopher John Boyle made a deliberate initiative to the fight against HIV/AIDS, and he was available at every campaign we had from 2003 on. We are happy to be associated with this success story. In 2002 the HIV prevalence rate was 20%. By 2005 it was down to 14% and in 2007 it was down to 7% a rate that is being maintained. What does this mean? There is one other group we would like to particularly encourage; the orphans. We have experienced firsthand reality what the loss of our parents meant when we were still young, and we feel with you, and you have a special place in your bishop’s heart. We hope we can be a shining example that all things are possible. Many times we felt defeated. Many times we had to say to ourselves, “What can we do to make this better?” Not everyone wanted to help and support us. Every time we had to remind ourselves that Jesus loves and cares for us. Every time we had to remember to cast our burden upon the Lord. With God all things are possible. May the Lord help you and show you the way. We know you have a great part to play in the life of this Diocese, in the life of this country, and we want to play the role well that God has assigned me, and we promise to make our contribution as his servant. In conclusion, my brothers and sister in the Lord, let us grow in faith and love and build up all that is for the common good. Let us sustain and build on this great success we have inherited from our beloved predecessors so that when the Great High Priest comes we will be ready to enter the banquet of His Kingdom with joy and praise. Claude. B. The Christian Faith: An introduction to Dogmatic Theology, Morehouse-Gorham: New York 1957p318.